NCL HEMM Operator Trainee Result 2019: Candidates applied for HEMM Operator Trainee Post has successfully completed their examination on 20th January 2019. And, waiting for the HEMM Singrauli Operator Trainee Final Result and were in the state of confusion from where to get the Results. We in this page provided clear data. As you know, Northern Coalfields Limited (NCL), Singrauli is recruiting 619 HEMM Operator Trainees this year. As per the notification, NCL HEMM Operator Result will be released in the month of 7th February 2019. And the Job location for the post is Across India. 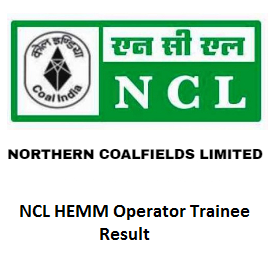 Northern Coalfields Limited (NCL), Singrauli has conducted the HEMM Operator Trainee Exam on 20th January 2019. There are several posts totally 619 Posts such as Continuous Miner Operator, Payloader operator, Dumper operator, Dozer Operator, Dragline Operator, Shovel Operator, Crane Operator, Grader Operator, Surface Miner Operator. All these posts will be filled only after the qualifying process. With this in mind after the Final Interview, the candidate can select the suitable post that he is secured for. As previously said, the selection process includes 3 rounds. For all those information keep in touch with us. scroll down for further more details. The Results are released only on the Official site of Northern Coalfields Limited (NCL), Singrauli i.e nclcil.in. Moreover, you can also get merit list form the official site only. Moreover, firstly, the officials may issue the individual scores of the exam holders. Later depending on the scores, the candidates will get filtered as per their dependencies and their categories. Hopefuls may stay patient until the results get released. Furthermore, you can get all the details of the NCL HEMM Merit List and HEMM Operator Trainee Cut Off Marks from the below sections. The HEMM Cut Off Marks and its clear data is given in this section. Moreover, candidates should keep this mind. The Officers will prepare the HEMM Operator Trainee Cut Off Marks based on the categories and the type of the post. And, also it varies from category to category. After writing an exam, knowing cut off marks is more important. Cut Off Marks For Dragline Operator and Other Operators based on the categories. The below specified cut off marks gives the clean details regarding the Dragline Operator and also other Operator posts cut off marks. After checking this, the hopefuls will have an idea about the maximum and minimum marks to be scored in the written examination for the post of HEMM Operator Trainee. Also, the aspirants should know the process to download their required Result cards from the website. For them, the detailed steps are explained in the below sections of this page. Firstly, the Candidates should visit the official site of Northern Coalfields Limited (NCL), Singrauli i.e nclcil.in. Now, on the right side of the page, you will find the Results column. Then, Click on NCL HEMM Operator Result 2019 Link. Next, you will find the fields asking for login credentials. Fill them correctly such as Id and password. You will find your NCL HEMM Operator Result on the screen. Check whether you are qualified or not, if so make a copy of that for future use. Keep checking regularly our site Freshers Now, for every latest update. Also, you can refer the information to your neighbors. So, you will become a helping hand to them. Don’t forget to bookmark and in case of queries leave a comment in the feedback section given below.